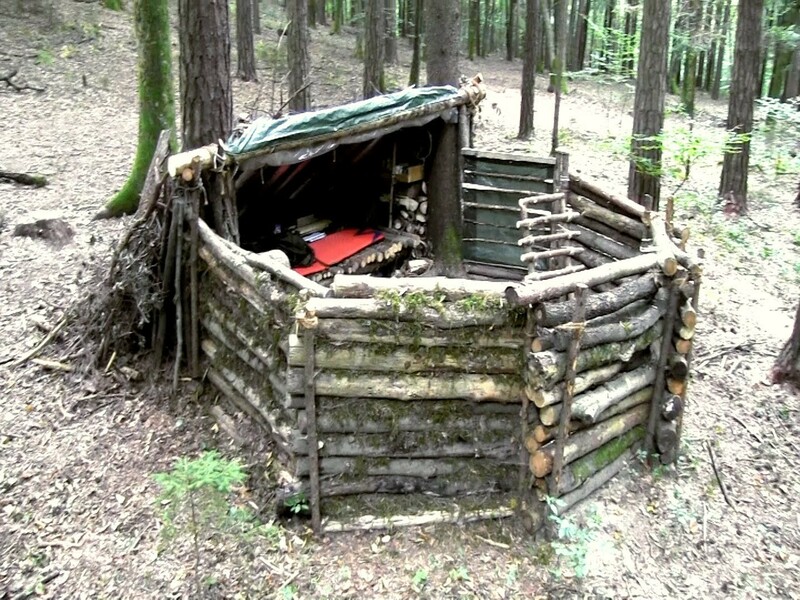 Check out this nice DIY shelter and hunting camp. It has a camouflaged lean-to sleeping area. It has walls surrounding it to be more secure from animals. There is a hunting stand inside it. It has a fire space and the lean-to has a mylar blanket as part of the ceiling so that it reflects the heat from the fire back at the sleeping space. This way you have the heat from the fire both from the front and then reflected from the back. There is a drop down plastic sheet in from of the sleeping space for when there is rain or wind. The plastic blocks the rain and wind out while allowing the heat of the fire to come through. The heat will be trapped inside the sleeping space helping to keep you warm in those rainy and or windy conditions. The video is by Survival Lily. She will take you through all the features of her shelter in the first video and in the second she spends the night in the shelter in winter. I like these videos mainly because they were by a woman and shows that women can be as capable at building a shelter as men. Most outdoor survival videos are by men so this was a nice change.